Royal Parks Half Marathon – Mission Complete! Home » Blog » Royal Parks Half Marathon – Mission Complete! Staying at home, watching a movie, reading, drinking a nice warm cup of tea – at 6am on a rainy Sunday in October, these are the kinds of activities that sound appealing. And yet last Sunday the Link Ethiopia running team, along with 17 supporters, found ourselves at our meeting point, ready to take on the 13 miles ahead of us. The day of the Royal Parks half marathon had arrived. Whether it was “looking forward to actually following a training plan and taking my weekend jogging up a notch” (Caroline), “encouragement (read peer pressure) from professional runner Rory and enthusiastic Caz” (Michou) or simply just challenging yourself and enjoying the atmosphere of an event like this, the first weeks of training were full of excitement and progress in terms of pace and distance covered. It was towards the middle of our 6 week training when fatigue started to set in. So what kept us going? Rory says: “A huge part of it was definitely running as a team. It was good motivation to have two fellow runners in the office, to compare training plans and to run together.” with Michou adding: “Every Monday morning we would discuss our progress; a particularly difficult run or an unexpectedly easy run and we would trade secrets; stretches that really helped, good running songs or apps to track you speed and distance – which was generally snail pace and not even half the distance you think you’ve done.” Caroline also mentions, that seeing our fundraising page total creep up provided the extra push on early mornings, when the temptation of soft pillows and just ‘5 minutes more in bed’ seemed to be overwhelming. With all its dramatic rain and thundery skies the day started out promising us a thoroughly miserable run. But the rain held off from the crossing of the start line and it was a joy to run with the crowd, zipping up to people every time you see another runner’s back proudly declaring ‘Changing lives through education’, to give them a pat and a breathless thumbs up. The park was beautiful and the crowd of charity banners, drumming groups, and cheer leaders – yes, real cheer leaders – kept the route interesting and uplifting. The real elation came at mile 11 when you finally see the flags of Link Ethiopia and our small crew of supporters – trustees, staff, family and friends – cheering and clapping on us on. 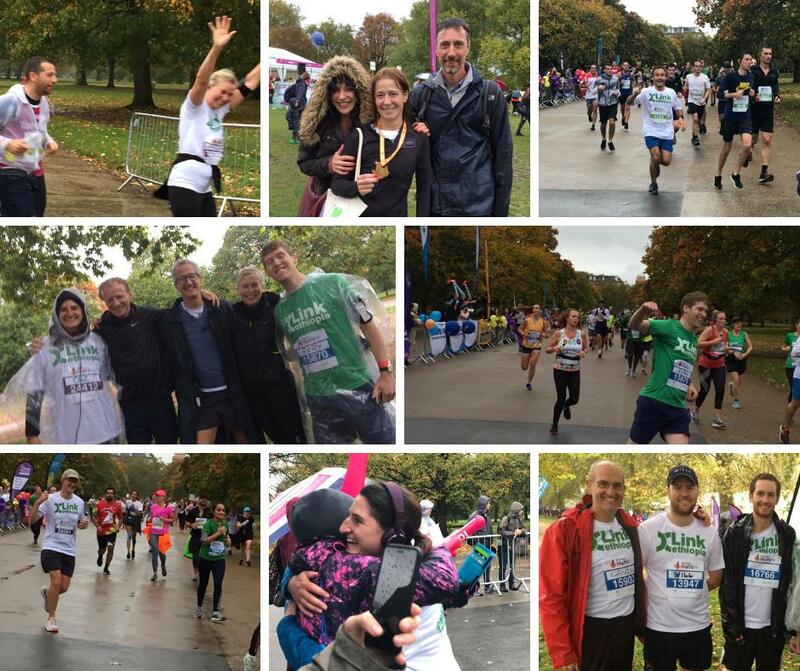 20 runners took part in the Royal Parks Half Marathon in support of Link Ethiopia – double the amount of last year! Each runner raised funds in advance of the race, sharing their story with their friends and networks. Overall, we have raised about £8,000 from our runners in the Royal Parks Half Marathon 2018, and we are so grateful for everyone who contributed. Around week 5 of our training schedule, we got a very good reminder from our team in Ethiopia of just how important such donated funds are. Our team in the Gondar office had contacted us in the London office about children who were in real need of help. One girl had been to our office asking the staff members for food, as her family could not afford to buy any, another girl was about to drop out of school and take up work where she would be at risk, as she had to find any source of income to feed herself. In all, there were 9 children that the staff brought to our attention that they were vulnerable and about to drop out of school because they needed to find a way to get money to feed themselves. We were able to help the children and their families with a package of direct financial support, educational materials and funds to buy food immediately. This support will continue until we are able to find permanent sponsors who can help these children in the long term. All the children have now been re-enrolled in school for this year and will continue their education. And it is fundraising at events like this, with donations from people like you that make this all possible. Now, were we crying when we crossed the finish line? 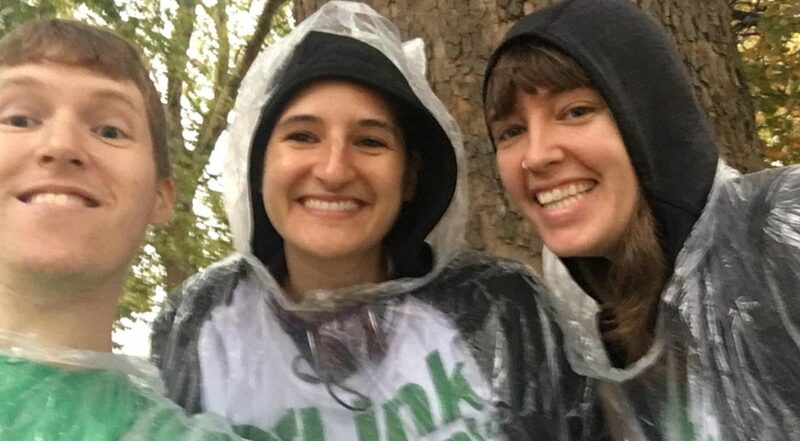 Caroline: ”At this point I was grateful for the rain, as I’m pretty sure I was crying”. But despite having lost all feeling in our limbs, and wondering whether we’d ever really be able to walk again, Caroline felt “warm and fuzzy”, Michou “proud” and Rory “fine, thanks.”. And that did not even compare to how elated we felt when we learned that the runners had raised £8,000 to support our work in Ethiopia! The VERY BIG thank yous! We are still in awe of our 20 runners who have done an amazing thing to take on this challenge and all made special efforts to raise awareness about and funds for our work. Thank you to every friend, relative and colleague who donated to the runners – your support makes the real difference here. Thank you to all the audience members who cheered, especially our Mile 11 crew who lifted the runners’ spirits so much at a crucial time. Very special thanks to Tim Otty, a supporter we are so lucky to have, who recruits runners for us every year, this year finding 15 our Royal Parks Runners and sets the standard for us all – this year Tim was the 40th out of 16,000 runners at Royal Parks! “I’m glad to say that our legs are slowly coming back to life after what was a bruising but amazing and unforgettable day. We have been so thrilled with how amazingly generous everyone has been, but a large part of that is because they wanted to support your phenomenal charity which is making a true difference to lives out in the real world. As for next year….who knows! We never thought that we’d be able to run 5K before the start of this year, let alone 21!” – Eliot, one of our amazing Link Ethiopia supporter runners, 2018. Our final thoughts on the day: “The Royal Parks was definitely the most fun I’ve had on a race day. I had a smile on my face the whole day.” (Rory), “I was so pleased to have taken part in this” (Caroline) and “I am thinking of maybe running another race again soon.”(Michou). If you want to join Michou, Link Ethiopia buys places at the Royal Parks half marathon every year and you can have a place in 2019! We ask that all runners aim to raise at least £300 which covers the cost of your place on the run and donation to our work. We will be looking for runners for 2019 from February so follow us on social media (Facebook, Twitter, Instagram) to hear when we’ve got spaces, or email us at [email protected], and will get in touch with you when registration opens next year. Link Ethiopia celebrates 20 years! Thank you for supporting Link Ethiopia's work. With your support we are changing lives through education.